This evening, immediately after writing down the ‘Hot Plate’ coincidence chain, I checked my email and saw that a new Google Alert for “synchronicity” had arrived. I was amused by the link “Amazing Internet Synchronicity” – because 1) my friend & coworker Workman – who I’d just been discussing synchronicity with – had sent me a link to that same swine flu cartoon earlier in the morning, and 2) I’d just had my own run-in with “digestive (*) disruptions” of my own (never take a zinc supplement on an empty stomach) – and I’d thought jokingly “maybe I have swine flu,” lying on the floor in distress. Included in the same Google Alert was a link to this blog post about Synchronicity – on a blog which you might notice is awfully familiar-looking. 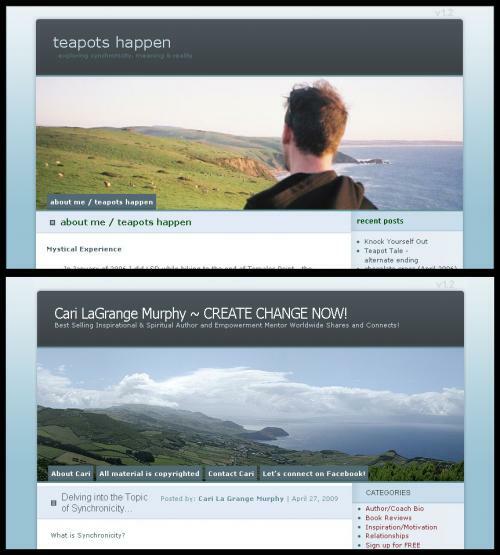 Sure, it is no surprise that there are other blogs using the same template as me – but fresh on the heels of the “amazing internet synchronicity,” the similar header photos and content (“Delving into Synchronicity”) was eerily amusing. Synchronicity is the process whereby our energy flows easily and beautifully and attracts to us all the ideal people and events that provide the perfect opportunity for growth. Awareness is key! There are no coincidences. Things, people, and circumstances come into our path for a reason. Synchronicity is the outward manifestation of our thoughts brought to us by our soul, linking and connecting us with others or with events that serve as meaningful opportunities that we have attracted into our experience to assist us in gaining clarity or evolving in some way. … I feel that synchronicity offers a beautiful bridge between our inner reality and the divine workings of spirit and our external reality that is revealed to us through our experiences. When we recognize these incidents as opportunities, life becomes VERY interesting! There is a sense of intrigue coupled with amusement when we start seeing things in new ways that broaden our perspective and engage our powers of manifestation with even greater intensity. I was reading this one today when it occurred to me that the header photo on Cari’s blog might actually be the default image used with the theme – so I checked into it, and yes it was! So the similarity is easily explained by my having been influenced by the original template photo (although ont he other hand, the pic I used in my header has always been the definitive “Point Reyes mystical experience” image). Well, this is the most interesting pingback I’ve ever gotten! I recently edited a book that refuted the concept of synchronicity as a mental aberration in otherwise rational people. The author was bemoaning the prevalence of “magical thinking” as a relic of our ancient ancestors — who may have been well served by “irrational” explanations of the world to overcome their fears and enhance their survival rates. I say he’s a big wet blanket. Even if synchronicity is belied by statistics, our perceptions still matter. Numbers aren’t everything! People who refute the concept of synchronicity are, in my humble opinion, part of a dying paradigm. It’s much easier to be a skeptic than it is to embrace something new and, well, something that seems magical. The thing with synchronicity is that is has a basis in quantum physics. And who wants to argue with those guys? This made me laugh out loud! True, but so funny. It seems to be a popular template for synchronicity blogs! Another one I found today!